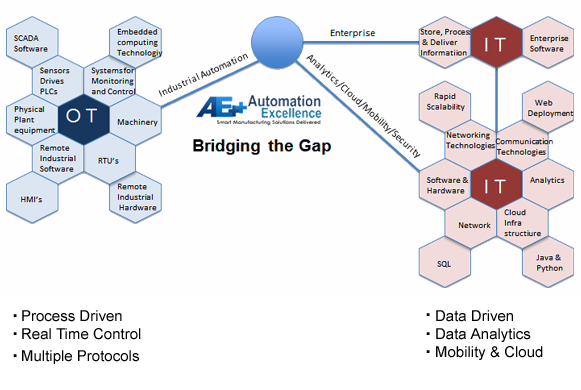 Automation Excellence combines the power of Industrial Automation and Information Technology and provides a seamless Smart Manufacturing Solution for the manufacturing Industry. ► One of very few companies having capabilities to provide solutions in Control, Power and Information solutions - including integration between Automation layer and ERP and configuring the different elements of IIOT as a connected Enterprise. ► Certified partner for Web Based SCADA and MES for Inductive Automation, USA on Ignition platform. ► Implementing Manufacturing Operations Management (MES ) for Auto, Tyre and CPG and integrating Automation systems to Enterprise solutions as part of IIOT framework. Mark Francis-graduated with a BE Degree in Electronics specializing in Power Electronics from Indian Institute of Science, Bangalore.Starting his career with M/s Kamani Metals and Alloys, Bangalore on a Reversible Cold Rolling Mill project, he has worked in a pioneering role in India with CGEE Alsthom (France) Drive Systems for Metal industry. He was involved in a number of installations and commissioning of Drive Systems for the paper industry and was a part of implementation team for a Paper Project in Allen-Bradley, Bletchley, England.He was with Allen- Bradley / Rockwell India for 23 years covering different levels including Regional Business Manager – Drive Systems, Regional Manager – Southern Region etc.,Has a rich experience in Automation and Drive system for various applications in Metals, Paper, Converting , Cement etc.,In the last few years he has been MES Practice Head delivering Manufacturing operations Management solutions to various industries including Tyre, Printing, Auto components, Automotive and Two wheeler industries. Aparna Gopalakrishnan-A Chartered Accountant with more than 15 years of corporate experience spanning areas of consulting/operations across India and Indonesia. As a consultant in Gobel International, a Joint Venture partner of National Panasonic in Jakarta, was instrumental in setting up the internal control and accounting systems of the Group and also integration with the subsidiaries. After relocating to India, joined KPMG in their Tax division and engaged with multinational clients – providing advisory, planning and compliance services for Corporates on Income tax matters as well as Advisory Services for Merger & Acquisitions and Due Diligence.Subsequently as Chief Financial Officer in an IT Software Services company, handled all operational areas including HR, Finance, Legal and Administration. Has extensive experience in setting up Policies, Procedures and Controls for the company from a start up stage to a large operation. Negotiated and finalised Bank arrangements for Business Funding as well as Term Loans for business expansion. Part of the due diligence team for Acquisition projects of the company. Also lead the finance function of the company for their offices in India and Mexico covering areas of Accounting, Budgeting, Cash Forecasting, Bank Financing, Financial Analysis, MIS Reporting, Audit and Statutory Compliances. Naresh Dayal – Regional Director-Engineer from Delhi College of Engineering he is an accomplished and seasoned professional with extensive experience in general management, sales and marketing, operations, and setting up greenfield projects in primarily a B2B environment. Management responsibility for both top line and bottom line performance, including setting up and managing independent Business Units.Experience includes creating and expanding new and existing businesses; developing and executing strategic and tactical business plans; developing significant new business through innovation and launching new products and solutions. Created alliances with a number of large companies for joint go-to-market especially targeting their existing customers. A pioneer in the field of Industrial Automation, he has been a part of the core team who set up a hi-tech manufacturing marketing organization in hitherto new products and services in industrial automation field manufacturing Drives and Automation systems. Arulwilliam - Graduated with a BE Degree in Electronics & Instrumentation at Government College of Technology, Coimbatore and has over 10 years experience with Core competency at all levels of Automation. He has specialized in the area of Industrial Information Systems including SCADA, MES & IioT Domain involving Plan, Design and developing MES Solutions, Design and Configure Network and OPC Layers, Understand and design reports as per business requirements, Architect and Program PLC, SCADA, Servo and HMI systems. He has worked extensively in implementing MES. He is familiar with multiple Tools and Software for Industry 4.0 .